Crim1, a transmembrane cysteine-rich repeat–containing protein that is related to chordin, plays a role in the tethering of growth factors at the cell surface. Crim1 is expressed in the developing kidney; in parietal cells, podocytes, and mesangial cells of the glomerulus; and in pericytes that surround the arterial vasculature. A gene-trap mouse line with an insertion in the Crim1 gene (Crim1KST264/KST264) displayed perinatal lethality with defects in multiple organ systems. This study further analyzed the defects that are present within the kidneys of these mice. Crim1KST264/KST264 mice displayed abnormal glomerular development, illustrated by enlarged capillary loops, podocyte effacement, and mesangiolysis. When outbred, homozygotes that reached birth displayed podocyte and glomerular endothelial cell defects and marked albuminuria. The podocytic co-expression of Crim1 with vascular endothelial growth factor-A (VEGF-A) suggested a role for Crim1 in the regulation of VEGF-A action. Crim1 and VEGF-A were shown to interact directly, providing evidence that cysteine-rich repeat–containing proteins can bind to non–TGF-β superfamily ligands. 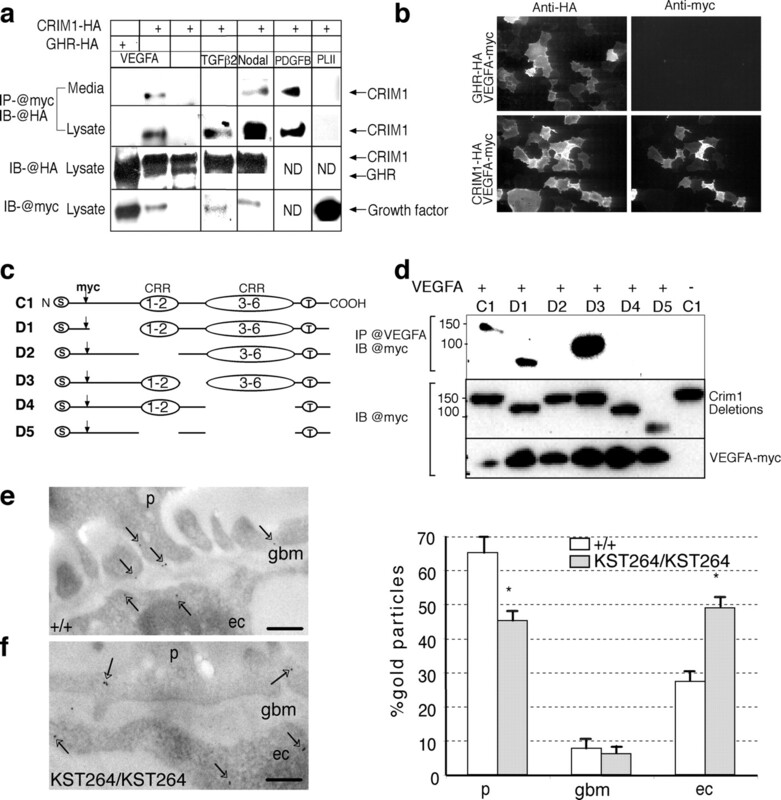 Crim1KST264/KST264 mice display a mislocalization of VEGF-A within the developing glomerulus, as assessed by immunogold electron microscopy and increased activation of VEGF receptor 2 (Flk1) in the glomerular endothelial cells, suggesting that Crim1 regulates the delivery of VEGF-A by the podocytes to the endothelial cells. This is the first in vivo demonstration of regulation of VEGF-A delivery and supports the hypothesis that Crim1 functions to regulate the release of growth factors from the cell of synthesis. The critical role that vascular endothelial growth factor-A (VEGF-A) plays in renal vascular development is well established (1). Podocyte expression of VEGF-A is essential for the development of the glomerular filtration system (2). Expression from the presumptive podocytes of the S-shaped body induces the inward migration of VEGF-A receptor 2 (flk1)-expressing endothelial cell precursors. The endothelial cells align in close apposition to the podocytes to become a capillary loop. This single loop splits or branches to form a complex glomerular capillary bed that is composed of many capillaries that are encased by podocytes and supported by mesangial cells. Within the glomerulus, the podocytes and endothelial cells both contribute to the glomerular basement membrane (GBM) that lies between these two cell types (3). Endothelial fenestrae that perforate the glomerular endothelium and slit diaphragms that are formed along the GBM by foot processes from the podocytes allow filtration of small molecular weight molecules from the blood. Podocyte expression of VEGF-A is thought to be necessary for the formation of endothelial fenestrations in the developing glomerulus, and continued expression in adult kidney suggests that it may play a role in the maintenance of both the GBM and the glomerular capillary fenestrations (2,4). A series of transgenic mouse studies of podocyte-specific over- and underexpression or knockout of specific isoforms of VEGF-A suggest that the availability of VEGF-A in the glomerulus is tightly regulated and that small perturbations to levels of VEGF-A during glomerular development have profound effects on glomerular architecture and function (1,2,5–7). The Crim1 gene encodes a protein that is expressed in a spatially and temporally restricted manner during organogenesis of the limbs, kidney, lens, pinna, erupting teeth, and testis (8–11). We previously demonstrated that Crim1 can bind to bone morphogenetic protein-2 (BMP-2), -4, and -7; however, ligand binding occurs within the cell and not in solution (12). Crim1 forms a complex at the cell surface with the preprotein forms of such ligands, retarding their secretion as mature active dimers (12). Although possibly antagonistic, Crim1-ligand binding may act to regulate the release of the ligand, with ligand release dependent on an external cue. We previously characterized the phenotype of the KST264 gene-trap mouse line, which has a β-Geo cassette inserted into intron 1 of the Crim1 gene. This mouse line is predicted to be a Crim1 hypomorph rather than a knockout as a result of the expression of a minor alternately spliced isoform of Crim1 that seems to be translated into a short form of the protein (11). The KST264 insertion results in perinatal lethality in inbred homozygous animals (Crim1KST264/KST264) but not in outbred homozygotes and defects in a variety of organ systems, including the limbs, eye, and kidneys (11). Our previous analysis of the Crim1KST264/KST264 mouse kidney revealed Crim1 expression in the pericytes of the renal arterial vasculature and in afferent arterioles. Within the kidney, Crim1 is expressed in mesangial cells, parietal cells, and podocytes, with expression increasing in these sites as the glomerulus matures (11). A role for Crim1 in vascular development was suggested by recent studies that suggested that knockdown of Crim1 in human umbilical vein endothelial cells prevented formation of vascular tubes (13), whereas in a zebrafish model, Crim1 morphants showed a disruption in hemangiogenesis (14). In this study, we focused on characterizing the renal defects in the KST264 gene-trap mouse line. In the kidneys of the Crim1KST264/KST264 mice, there was evidence of a defect in the formation of the glomerular capillary loops, illustrated by disruption to endothelial cell adhesion to the GBM, disruption to the mesangial cells, and podocyte effacement. Adult outbred Crim1KST264/KST264 mice presented with albuminuria and a reduced GFR. We showed biochemically that the Crim1 protein could bind VEGF-A. Immunogold analyses revealed a disrupted partitioning of VEGF-A between the podocytes and endothelial cells, and immunofluorescence analysis showed increased Flk1 activation in the glomerular endothelial cells. These data provide evidence that Crim1 is involved in the tightly controlled regulation of VEGF-A delivery in the glomerulus and that disruption to Crim1 can perturb development of the glomerular filtration unit. The maintenance and the production of mice that possess the KST264 gene-trap have been described previously (11). Embryonic tissue was obtained from the C57/Bl6 inbred strain, whereas for adult tissue, the C57/Bl6 were crossed with the outbred CD1 strain. Viable adult Crim1 homozygotes were obtained from this line. Use of animals in this study was done in accordance with the animal ethics committee, University of Queensland (CMCB/535/04/NHMRC) and Monash University. Genotyping was performed as described (11). Before X-gal staining, tissue samples were fixed in 4% paraformaldehyde in PBS at 4°C for 1 h and washed in PBS at room temperature. Samples were incubated in stain buffer (5 mM potassium ferricyanide [Sigma, St. Louis, MO]), 5 mM potassium ferrocyanide, 2 mM magnesium chloride, 0.01% sodium deoxycholate, 0.02% NP-40, and 1 mg/ml X-gal) at 37°C for 1 to 4 h. Samples were then washed in PBS before photography and processing for paraffin embedding. Immunohistochemistry was performed on deparaffinized and rehydrated 4-μm, paraformaldehyde (4%)-fixed, paraffin-embedded sections. Antigen retrieval was performed by treating sections with proteinase K (0.01 mg/ml in buffer that contained 50 mM Tris [pH 8.0] and 5 mM EDTA) for 10 min at 25°C, then endogenous peroxidase activity was quenched by incubation of sections in 3% H2O2 in water for 30 min. For polyclonal antibodies, sections were blocked (2% sheep's serum in PBS) for 1 h and incubated for 2 h with primary antibodies diluted in blocking serum. Secondary biotinylated antibody and tertiary streptavidin incubations were performed using an ABC kit (Vector Laboratories, Burlingame, CA), then visualized with the DAB-Plus Substrate kit (Zymed Laboratories, South San Francisco, CA) according to the manufacturer's instructions. For mAb, the MOM kit (Vector Laboratories) was used. Photographs were taken using an Olympus AX70 compound microscope with Kodak Elite Ektachrome 160T film. Antibodies that were used included laminin α5 (15), Wilms' tumor 1 (WT1; Dako, Botany, Australia), CD31 and phospho-Smad 2/3 (Chemicon Int., Temecula, CA), phospho-Smad 1/5/8 (Cell Signaling Technology, Danvers, MA), and phospho-Flk1 (Merck Pty. Ltd., Victoria, Australia). For immunofluorescence, secondary antibodies used were fluorophore-conjugated anti-mouse Alexa 488 or anti-rabbit Alexa 594 (Molecular Probes, Eugene, OR). Tissue was incubated with the secondary antibody for 45 min, washed thoroughly in PBS, and mounted in Vector Shield (Vector Laboratories). Digital images were taken using an Olympus AX70 compound microscope. Kidneys were dissected from embryos at day 17.5 and processed as already described (16). Briefly, samples for routine ultrastructural analysis were fixed in 2% glutaraldehyde in 0.1 M cacodylate buffer and embedded in Epon resin. For immunoelectron microscopy, samples were fixed in 4% paraformaldehyde and 0.1% glutaraldehyde, partially dehydrated in acetone, and embedded in LR-Gold resin with polymerization carried out at −25°C. Ultrathin sections were cut on a Leica Ultracut T microtome and viewed under a JEOL 1010 electron microscope at 80 kV. For VEGF-A immunodetection, 80-nm sections were mounted on 200-mesh thin-bar nickel grids previously coated with parlodion. Antibodies used were VEGF-A (Chemicon) and anti-mouse secondary coupled to 10 nm of gold particles (Aurion, Wageningen, The Netherlands). Quantification of gold particles associated with podocyte, GBM, and capillary loop endothelium was performed at ×50,000 magnification. Forty areas of the glomerular filtration barrier of juxtamedullary glomeruli were randomly selected in both wild-type littermates and Crim1KST264/KST264 17.5 d post coitus (dpc) kidneys. Cos-7 cells were seeded into six-well plates. After 24 h, medium was changed to OPTIMEM (Invitrogen, Mulgrave, Australia), and cells were transfected using Fugene (Roche) with constructs that contained cDNA for the following receptors and ligands: mouse (m) Crim1, human growth hormone receptor (hGHr), mVEGF-A 164, mnodal, mPDGF-B, mTGF-β2, and mouse placental lactogen II (PLII). Medium or cells were harvested after 48 h.
For in vitro binding experiments, conditioned medium was cleared by centrifugation. Cell lysates were prepared by addition of 600 μl of lysis buffer (0.1% Triton X100 and complete protease inhibitors [Roche] in PBS) to wells and incubation for 10 min. Immunoprecipitations were performed by addition of 4 μl of anti-myc or monoclonal VEGF-A antibody (Chemicon, Boronia, Australia) and incubation for 2 h at room temperature. A total of 20 μl of protein A Sepharose slurry (Sigma) was added and incubated for an additional hour. The beads were pelleted and washed three times with RIPA buffer (20 mM Tris [pH 7.4], 0.1% SDS, 1% Triton-X100, 1% deoxycholate, and 0.15 M NaCl) and once with PBS. Protein was eluted by addition of SDS-PAGE loading buffer (0.025 M Tris-HCl [pH 6.8], 4% SDS, 10% β-mercaptoethanol, 40% glycerol, and 0.05% bromophenol blue) and boiling for 5 min. For observation of cell-surface proteins, primary and secondary antibody binding was performed on live cells that were incubated on ice to prevent internalization as described previously (12). Antibody labeling was captured on an Olympus AX70 compound fluorescence microscope. Antibodies used were anti-myc (clone 9E10), anti-HA (HA.11; Chemicon), anti-rabbit cy3, and anti-mouse Alexa Fluor 488 (Molecular Probes). Twenty-four-hour conscious urinary excretory profile, anesthetized renal function, and renal histopathology were documented in outbred male mice (Crim1+/+, n = 9; Crim1+/KST264, n = 14; Crim1KST264/KST264, n = 10). At 9 wk of age, trained mice were placed in individual metabolic cages to obtain a 24-h urine collection. Urinary sodium and potassium were analyzed using spectrophotometry (Synchron CX5CE Delta; Beckman Coulter, Sydney, Australia), and osmolality was measured by freezing point depression (Advanced Osmometer 2020; Advanced Instruments, Norwood, MA). Urinary albumin concentration was determined using a murine-specific microalbuminuria ELISA kit (Exocell, Philadelphia, PA). Values for albumin were corrected for urinary creatinine using a creatinine companion assay (Exocell). For anesthetized renal function, mice at 10 wk of age were anesthetized intraperitoneally with thiobutabarbitone (Inactin 150 mg/kg; Sigma-Aldrich) and ketamine (10 mg/kg; Parnell Laboratories, Alexandria, Australia). Body temperature was maintained at 37.5°C. The trachea was catheterized (PE50 polyvinyl tubing; Microtube Extrusions, Melbourne, Australia), and a stream of oxygen was blown over the end of the trachea tube. The right carotid artery was catheterized (SV35) for measurement of mean arterial pressure, heart rate, and blood sampling. The right jugular vein was catheterized (PE10) for the infusion of 1% BSA (0.15 ml/h; Sigma-Aldrich) that contained 3H-Inulin (11.16 μCi/ml) and 14C-paraaminohippurate (0.74 μCi/ml; Perkin Elmer, Melbourne, Australia) to enable measurement of GFR and effective renal plasma flow, respectively, using standard clearance formulas. The bladder was catheterized (PE20) for the collection of urine. Mice were allowed to equilibrate for 1 h before two consecutive, timed urine collection periods of approximately 15 min each. At the conclusion of the urine collection periods, a blood sample was taken via the carotid artery catheter. For adult renal histology, a catheter (SV35) filled with 1 M phosphate buffer (pH 7.4) containing sodium nitroprusside (Sigma-Aldrich) was placed into the aorta below the renal arteries. The kidneys were then perfused clear of blood with the rinse solution before switching to a solution that contained Karnovsky's fixative (2% paraformaldehyde and, 2% glutaraldehyde) in 1 M phosphate buffer for 10 min. All subsequent sections were coded such that analysis was performed in a blind manner. Fixed left kidneys were cut in half coronally, with one half processed and embedded in paraffin and the remainder subjected to electron microscopy (EM) as described. Blocks were sectioned at 4 μm and stained with Masson's trichrome method for examination of gross renal pathology. Data are presented as means ± SEM. For comparison of the distribution of gold particles on the glomerular filtration barrier and for adult renal function tests, statistical analysis was performed using a one-way ANOVA. Differences between groups were determined by a Dunnett post hoc test. We previously showed using X-gal staining of the KST264 gene-trap reporter that Crim1 is expressed in podocytes, parietal cells, mesangial cells, and vascular smooth muscle in both the embryonic and the adult kidney (11). In this study, we looked in more detail at Crim1 expression during kidney development. X-gal staining first appeared at approximately 14 dpc in areas within the interstitium (Figure 1A). These cells aligned in cords within the interstitium (Figure 1B), ultimately forming the pericytes that lie along the outside of the endothelial cells in the developing arterial vasculature (Figure 1C). X-gal–positive mesangial cells appeared in the developing glomerular tuft at the capillary loop stage of renal corpuscle formation (Figure 1, B and D). In the mature embryonic glomerulus, staining was also present in the podocytes and parietal cells (Figure 1E). Analysis of Crim1KST264/KST264 kidneys reveals defects in glomerular capillary development. (A through G) LacZ analysis of embryonic Crim1KST264/KST264 kidney. (A) LacZ staining in the interstitium of 14 d post coitus (dpc) Crim1KST264/KST264 kidney marks presumptive pericytes (arrow). (B) LacZ staining in cells that form afferent arteriole (arrow) and in mesangial cells (arrowhead) of capillary loop stage glomerulus. (C) Strong lacZ expression along the walls of a developing afferent arteriole in 15.5 dpc kidney, suggesting expression in the pericytes (arrowhead) but not the endothelial cells of this structure. (D) LacZ staining was clearly evident in the parietal epithelial cells (pe) and mesangial cells (me) of a more mature capillary loop stage glomeruli and in mature glomeruli (17.5 dpc; E). Aberrant inflated glomerular capillary loops (*) in 15.5 dpc (F) showing lacZ staining of the podocytes, me, and pe. (G) LacZ staining of homozygous 15.5 dpc glomerulus showing severely affected glomerulus with a single dilated capillary filled with red blood cells. (H) A wild-type glomerulus showing podocytes (pd) and glomerular capillaries (*) is shown for comparison with Crim1KST264/KST264 glomeruli. (K through I) Thick sections of 17.5 dpc embryonic kidneys showing blood pooling (arrowheads) in Crim1KST264/264 (K) and Crim1+/KST264 (J) kidney compared with a wild-type kidney (I). (L) Hematoxylin and eosin section of 17.5 dpc glomerulus showing blood pooling in the dilated capillaries Bars = 10 μm (A, B, D, F through H, and L), 30 μm (C), 15 μm (E), and 300 μm (I through K). Simplification and dilation of the glomerular capillaries was evident from 15.5 dpc in glomeruli from both Crim1+/KST264 and Crim1KST264/KST264 mice (Figure 1F) and persisted in 17.5 dpc Crim1+/KST264 and Crim1KST264/KST264 glomeruli (Figure 1, F and G) compared with wild-type mice (Figure 1H). 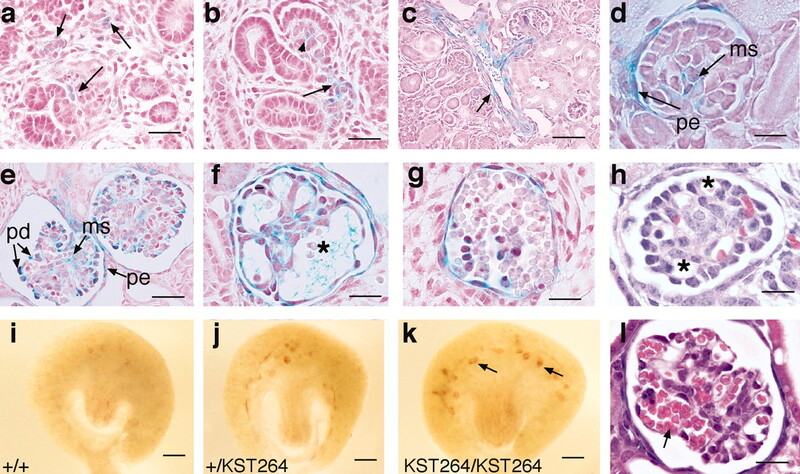 At a macroscopic level, in comparison with wild-type E17.5 dpc kidney (Figure 1I), there was visible accumulation of blood within the glomeruli in Crim1+/KST264 (Figure 1J) and Crim1KST264/KST264 (Figure 1K) kidneys, and pooling of erythrocytes in some dilated capillaries was evident in sections (Figure 1L). Thin section histology and EM were used to characterize further the glomerular defect present. This analysis revealed that Crim1KST264/KST264 glomeruli displayed multiple lesions of the glomerulus (Figure 2, D through I) as compared with wild-type glomeruli (Figure 2, A through C). Podocyte differentiation was severely impaired with defects in foot process formation (Figure 2, F through H). Although this feature was prominent, normal slit diaphragms were occasionally observed (Figure 2, F and G). The GBM was thin, as expected for this stage of development, and did not differ from that of the wild-type littermates (Figure 2, B versus G). Nevertheless, irregular GBM was observed in the most damaged glomeruli (Figure 2H). Although light microscopy failed to reveal any changes in glomerular endothelial cells, electron micrographs showed that they were frequently detached from the GBM (Figure 2F). In addition, some capillaries exhibited signs of endothelium overgrowth with numerous cytoplasmic protrusions in the lumen (Figure 2D). In the glomerular tuft, mesangiolysis was present in the most mature glomeruli and was observed without any endothelial cell loss (Figure 2, E and I). Within the dilated lumens of these abnormal vascular tufts, there seemed to be many erythrocytes (Figure 2, A versus E). This may indicate that this structural anomaly was accompanied by a reduction in pressure and a pooling of red blood cells. Ultrastructural analysis of the kidney of Crim1KST264/KST264 mice. Light and electron micrographs were taken from embryonic day 17.5 control (A through C) and Crim1KST264/KST264 mice (D through I). In control glomeruli, mesangial cells (A and C, thick arrows) provide structural support to the developing capillary loops. Numerous endothelial cells are present (A, thin arrows). At higher magnification, the glomerular basement membrane (GBM; B, arrowheads) separates the capillary loop from the podocytes. At this stage, the glomerular endothelium is not fully fenestrated, and podocytes from the more mature glomeruli have developed numerous foot processes (B, arrows). In Crim1KST264/KST264 mice, glomeruli are enlarged and filled with numerous red blood cells (E). Endothelial cells that are focally detached from the GBM (F, arrows) and foot processes are obliterated (G, open arrows), although some slit diaphragm membranes can still be observed (F, arrowheads). In more severely affected glomeruli, the GBM is irregular and thickened (H, arrows). Mesangiolysis is prominent in the more mature glomeruli (E and I, *). cap, glomerular capillary; ec, endothelial cell; mc, mesangial cell; p, podocyte. Bars = 20 μm (A and E), 2 μm (B through D, H, and I), and 1 μm (F and G). The presence of glomerular capillary abnormalities in Crim1KST264/KST264 mice led us to examine more carefully the identity of the lacZ-positive cells within the developing renal corpuscle. With the use of WT1 to mark the podocytes, immunohistochemistry confirmed that the podocytes of Crim1+/KST264 mice were lacZ positive (Figure 3A). Using antibodies for CD31/platelet-endothelial cell adhesion molecule-1 to mark endothelial cells, we also confirmed that these cells were not lacZ positive (Figure 3B). WT1-positive podocytes seemed to be reduced in number in Crim1KST264/KST264 versus wild-type mice (Figure 3, C and D). This does not prove a reduction in podocyte number per se but demonstrates a potential loss of identity, which may correlate with the structural defects that were observed in the podocytes of these mice. CD31 immunohistochemistry showed the clear presence of endothelial cells in both wild-type and Crim1KST264/KST264 mice (Figure 3, E and F) but confirmed the ultrastructural observations of an abnormal capillary network in the mutants. Analysis of the Crim1 KST264/KST264 mice confirmed the presence of desmin-positive mesangial cells (Figure 3, G and H). Laminin α5, a component of the GBM that is important for interactions among the mesangial cells, podocytes, and endothelial cells (17,18), was also present but appeared disordered and thickened (Figure 3, I and J), suggestive of alterations to the glomerular filtration barrier. Immunohistochemical analysis of glomerular defects in Crim1KST264/KST264 mice. Sections were assessed by immunohistochemistry (A, B, and E through J) or immunofluorescence (C and D) using the antibodies indicated. A and B were stained for lacZ before sectioning to highlight expression of the Crim1 transgene. C through J are from 17.5 dpc embryos, whereas A and B are from 15.5 dpc embryos. (A) LacZ staining showed co-localization with the podocyte marker Wilms' tumor 1 (WT1). (B) CD31, which marks endothelial cells, was not co-localized with lacZ. WT1 immunofluorescence revealed fewer podocytes in the mature homozygous glomerulus compared with the wild-type (C and D). CD31 staining outlined the glomerular capillaries showing the gross dilation of the capillaries in the homozygous glomerulus (F) compared with the wild-type (E). Desmin staining (G and H) was equivalent in both wild-type and homozygous sections. Laminin α5 staining was present in both samples (I and J) but appeared abnormal in the Crim1KST264/KST264 mice (J), suggesting a GBM defect. Bars = 15 μm. As reported previously, Crim1KST264/KST264 mice on a C57/Bl6 background are perinatal lethal. Outbreeding of the KST264 line onto a CD1 background for one generation resulted in the birth of a proportion of homozygotes that survived to adulthood. Ratios at birth for these litters reveal that only 15% of mice were Crim1KST264/KST264, suggesting that a significant proportion of homozygotes still did not survive. We examined the pathology and renal physiology of both Crim1+/KST264 and Crim1KST264/KST264 outbred mice (Figure 4, A through F). A distinct feature of adult kidneys of Crim1KST264/KST264 mice (Figure 4, C, D, F, and H through J) was the presence of small cysts and areas of tubular dilation (Figure 4, C and D). In addition, glomeruli and Bowman's capsule were markedly larger in Crim1KST264/KST264 than in wild-type glomeruli and extended to the outer most regions of the cortex (Figure 4, A versus C and D). Large glomerular cysts were also present (Figure 4E). The glomerular tuft in these large cysts was abnormal and resembled collapsing glomerulopathy (Figure 4F). Crim1KST264/KST264 kidneys also showed areas of interstitial fibrosis and glomerular obsolescence (Figure 4D). Crim1+/KST264 kidneys seemed relatively normal, apart from occasional areas of tubular dilation (Figure 4B) and interstitial fibrosis. Evidence of glomeruli defects in adult Crim1KST264/KST264 kidneys. Light micrographs of the outer cortex of kidneys from Crim+/+ (A), Crim1+/KST264 (B), and Crim1KST264/KST264 (C and D) mice stained with Masson's trichrome. Crim1KST264/KST264 mice demonstrate numerous enlarged glomeruli extending into the outer cortex (C), glomerular obsolescence (D, *), tubular dilation, and areas of interstitial fibrosis (D, arrow). Cystic glomerulus showing enlarged Bowman's space (BS; E), and higher magnification showing collapse of the glomerular tuft (F). Electron micrographs of Crim+/+ (G) and Crim1KST264/KST264 (H) kidneys. Capillaries (C) from Crim1KST264/KST264 mice demonstrated areas of podocyte effacement and apparent loss of endothelial fenestrae. Albumin-to-creatinine excretion ratio was increased three-fold in Crim1KST264/KST264 adult mice compared with wild-type (I). Bars = 50 μm (A through F) and 2 μm (G and H). Whereas some Crim1KST264/KST264 glomeruli demonstrated normal glomerular filtration barriers, many glomeruli demonstrated segments of podocyte foot process flattening and effacement (Figure 4, H versus G). There was also evidence of loss of endothelial fenestrae and thickening of the endothelial cells (Figure 4H). The GBM did not seem to be different from that of wild-type mice (Figure 4, H versus G). The glomeruli of Crim1+/KST264 mice seemed normal (data not shown). Adult Crim1+/KST264 and Crim1KST264/KST264 mice did not differ from wild-type mice in body weight or 24-h urine, sodium, potassium, or osmolality excretion (Table 1). Crim1KST264/KST264 mice, however, showed a three-fold increase in 24-h albumin excretion and albumin-to-creatinine excretion ratio (Figure 4I). Crim1+/KST264 mice showed no changes in 24-h albumin excretion. GFR of Crim1KST264/KST264 mice was 40% lower than that in wild-type mice (P < 0.05; Table 2). Although not statistically significant, values for effective renal plasma flow of Crim1KST264/KST264 mice were lower than those of wild-type mice (Table 2). Crim1KST264/KST264 mice were not different from wild-type mice with respect to anesthetized mean arterial pressure, hematocrit, left ventricle weight, or left kidney weight, although the kidney-to-body weight ratio of Crim1KST264/KST264 mice tended (P < 0.066) to be greater than that of wild-type mice (Table 2). Crim1+/KST264 mice did not differ from wild-type mice (Table 2). The vascularization of the kidney is regulated, as in other organs, by the production of VEGF-A. VEGF-A is strongly expressed in the podocytes of the developing kidney (19). Although not a member of the TGF-β superfamily, VEGF-A is structurally related to members of this family because all these proteins contain a cystine-knot motif (20). Given the coexpression of Crim1 and VEGF-A, we used co-immunoprecipitation to demonstrate an interaction between Crim1 and VEGF-A (Figure 5A). To control for artifactual binding, we showed that there was no interaction between VEGF-A and another transmembrane protein, growth hormone receptor (Figure 5A). Immunoprecipitation showed Crim1 binds to a broad range of members of the TGF-β superfamily, including TGF-β2 and nodal, as well as another growth factor, PDGF, a protein that is more similar in structure to VEGF-A (Figure 5A). This suggests a broader ligand-binding capacity than previously described for Crim1. The commonality of these distinct protein families is the existence of a cystine-knot motif (21). PLII, a growth factor from the growth hormone family that does not contain a cysteine-knot motif, did not bind Crim1 (Figure 5A), supporting a model in which Crim1 binds to the growth factor via the cysteine-knot motif. Using co-immunofluorescence, we showed that VEGF-A was tethered to the cell surface when coexpressed with Crim1 (Figure 5B). Using a series of Crim1 deletion constructs described previously (12) (Figure 5C), we determined that cysteine-rich repeat (CRR) domains in Crim1 are essential for VEGF-A binding. Deletion constructs in which these domains were missing displayed no binding to VEGF-A by co-immunoprecipitation (Figure 5D). These results are similar to those found for Crim1 binding to BMP-4 (12). However, whereas Crim1 maintained BMP-4 binding to a reduced extent when at least some of these repeats were present, VEGF-A seems to require the full set of CRR for binding. Evidence for an interaction between vascular endothelial growth factor-A (VEGF-A) and Crim1 in vivo. (A) Immunoprecipitation analyses of Cos-7 cells that were transfected with tagged Crim1 (CRIM1-HA), VEGF-A-myc (VEGF-A), TGF-β2-myc (TGFβ2), Nodal-myc (Nodal), PDGF-B-myc (PDGFB), placental lactogen II (PLII), and growth hormone receptor (GHR-HA) either alone or in combination. Cell lysates and media were immunoprecipitated using an anti-myc antibody (IP-@myc). Western blots were then probed with anti-HA (IB-@HA). VEGF-A was co-immunoprecipitated with Crim1 but not with GHR. TGF-β2-myc, Nodal-myc, and PDGFB-myc were co-immunoprecipitated with Crim1. Western analysis of aliquots of lysate before immunoprecipitation confirmed that all constructs were expressed (bottom panels, IB-@HA and @myc). (B) Immunofluorescence was performed on Cos-7 cells that were co-transfected with the same constructs that were used for immunoprecipitation and visualized using anti-HA and anti-myc antibodies. VEGF-A was visible on the cell surface when co-transfected with Crim1 but not when co-transfected with GHR. (C) Schematic of Crim1 deletion constructs used for immunoprecipitation in D. S, signal sequence; 1 to 6, cysteine-rich repeat (CRR) repeats 1 to 6; T, transmembrane domain; myc, site of introduced myc tag. (D) Immunoprecipitation analysis of Crim1 deletion constructs with VEGF-A. Cos-7 cells were co-transfected with a full-length Crim1 construct or the deletion constructs as indicated and VEGF-A-myc. Culture medium was immunoprecipitated (IP) with anti–VEGF-A, and Western analysis (IB) was performed using anti-myc. Cell lysates were subjected to Western analysis (IB) using anti-myc to ensure that transfection was successful. Only full-length Crim1 and deletions D1 and D3, which all contain the full six CRR, co-precipitated with VEGF-A. (E and F) Localization of VEGF-A expression in the wild-type (E) and Crim1KST264/KST264 (F) kidney by immunogold electron microscopy. Gold particles can be clearly seen in podocyte (p), GBM, and endothelial cell (ec) compartments (arrows). Bar = 0.5 μm. (G) Quantification of the distribution of VEGF-A over the glomerular filtration barrier of wild-type and Crim1KST264 mice. VEGF-A distribution is clearly more diffuse in the Crim1KST264/KST264 mice. *P < 0.01. Given this evidence for an interaction between VEGF-A and Crim1 and their coexpression in the podocytes, we examined the possibility that the absence of full-length Crim1 protein in the Crim1KST264/KST264 mice resulted in an impaired VEGF-A partitioning between the podocytes and the endothelial cells in vivo. Using immunogold EM, we analyzed the distribution of VEGF-A across the glomerular filtration barrier in 17.5 dpc kidneys. In wild-type embryonic kidneys, 65% of VEGF-A protein was present on the podocytes, 8% within the GBM, and 27% over the endothelial cells (Figure 5, E and G). This is consistent with data that were gained from mature adult glomeruli (22). In contrast, immunogold localization of VEGF-A in Crim1KST264/KST264 mice showed a reduction in podocytic localization (45%) and a concomitant increase in localization of VEGF-A over the endothelial compartment (48%) with no change over the GBM (6%; Figure 5, F and G). VEGF-A primarily signals through the receptor Flk1, which is expressed on endothelial cells in close proximity to VEGF-A–expressing cells (23). Upon VEGF-A binding, Flk1 dimerizes and autophosphorylates, beginning the signaling cascade that culminates in angiogenesis and vasculogenesis. Considering the altered distribution of VEGF-A in the Crim1 KST264/KST264 glomerulus, we compared the levels of Flk1 phosphorylation between the wild-type and Crim1KST264/KST264 15.5 and 17.5 dpc embryo. Co-immunofluorescence of kidney sections was performed using an antibody against WT1 to mark podocytes and a phospho-specific Flk1 antibody. Results revealed the endothelial cell membrane localization of phospho-Flk1 and showed that it is markedly increased in the 17.5 dpc Crim1KST264/KST264 glomeruli from capillary loop stage onward (Figure 6A) compared with wild-type (Figure 6B). Results for 15.5 dpc showed a similar increase in phospho-flk1, but levels overall for both wild-type and Crim1KST264/KST264 glomeruli were lower (data not shown). Because Crim1 can bind members of the TGF-β superfamily (12), we assessed whether there was evidence for altered TGF-β superfamily signaling in Crim1KST264/KST264 mice using immunohistochemistry for phospho-Smad2/3 and phospho-Smad 1/5/8. We could not detect any difference in nuclear phospho-Smad2/3 or phospho-Smad 1/5/8 between wild-type and Crim1 KST264/KST264 glomeruli at 15.5 dpc (data not shown) or at 17.5 dpc for phospho-Smad 2/3 (Figure 6, C and D). However, at 17.5 dpc, there was a reduction in the levels of phospho-Smad 1/5/8 in the Crim1 KST264/KST264 glomeruli (Figure 6E) compared with wild-type (Figure 6F). The decrease in phospho-Smad1/5/8 in the glomerulus was largely confined to the podocytes (Figure 6F) in mature glomeruli. Loss of Crim1 results in activation of the VEGF-A pathway but not TGF-β pathways. For assessment of which growth factor pathways were affected in the Crim1KST264/KST264 mutants, immunofluorescence (A and B) and immunohistochemistry (C through F) of 17.5 dpc glomeruli were performed using antibodies to the phosphorylated (activated) form of downstream affectors of the VEGF-A, TGF-β1 and 2, and bone morphogenic protein pathways. Immunofluorescence using anti–phospho-Flk1(red) and anti-WT1 (green) to mark podocytes shows that the phosphorylated form of Flk1 was present to a greater extent in the Crim1KST264/KST264 glomerular endothelial cells (A) than in the wild-type glomerulus (B). In contrast, immunohistochemistry using antibodies to phospho-Smad 2/3 (C and D) showed no difference between wild-type (C) and Crim1KST264/KST264 (D) glomeruli. Phospho-Smad1/5/8 levels (E and F) were reduced in podocytes of the Crim1KST264/KST264 glomerulus compared with the wild-type. Crim1 was previously proposed to act via modulation of the TGF-β superfamily, and we have verified that Crim1 can interact with BMP via its CRR motifs (12). In this study, we revealed a wider degree of promiscuity with respect to Crim1 ligand binding, showing, for the first time, an interaction with ligands outside the TGF-β superfamily, including an interaction between Crim1 and VEGF-A. This is not surprising because, in elucidating the three-dimensional structure of chordin-like repeats, it was shown that these repeats contain a structurally equivalent fold to that of the VEGF-A binding domain of fibronectin type I (24). Furthermore, both the TGF-β/BMP and the VEGF/PDGF contain a cystine-knot motif (21), and connective tissue growth factor, a CRR-containing protein, is known to bind VEGF-A (25). Crim1 may therefore act on multiple cystine-knot–containing ligands. In support of this, we found that Crim1 does not bind to PLII, a growth factor that does not contain a cystine-knot motif (26). Although a number of different splice variants of VEGF-A are expressed, the region coding for the cystine knot (exons 2 to 5) is present in all currently known variants (20,27), so Crim1 would be expected to bind all VEGF-A isoforms. Many growth factors are sequestered to the cell surface at some point after secretion, and the importance of cell-surface factor binding for normal function is becoming increasingly apparent (6,28–30). Crim1 must be coexpressed with its binding partner and can act to tether the preprotein forms of BMP at the cell surface (12). Although VEGF-A and PDGF are not produced as preproteins that require furin processing for activation, the longer isoforms of VEGF-A are known to be released from the cell surface via specific cell-surface proteases such as plasmin and urokinase type plasminogen activator, and VEGF-A189 requires enzyme maturation for full receptor-binding activity (20). Hence, the tethering effect of Crim1 on VEGF-A may similarly affect rates of maturation and effective concentration gradients. Release of the active ligand may in part depend on cleavage of Crim1 from the cell surface (12), as with chordin and connective tissue growth factor, which both require cleavage by metalloproteases to release active ligand (25,31). The gene-trap insertion that is present in the Crim1KST264/KST264 mice is predicted to splice out exon 2. The loss of this region alone would not affect the ability to bind to VEGF-A. Our previous analysis of this mouse shows that the protein that is produced from the exon 2 deletion isoform also lacks the CRR region, resulting in a nonfunctional protein with respect to VEGF-A tethering. However, it remains possible that some aspects of the defect result more directly from the presence of this shorter version of the protein. The Crim1KST264/KST264 mouse presents with defects in glomerular development, including dilated capillaries, endothelial cell overgrowth, pooling of red cells in these capillaries, mesangiolysis, and podocyte effacement. Glomeruli in the adult mice also show podocyte effacement, endothelial cell thickening, loss of endothelial cell fenestrae, and glomerular cysts. We have shown here that the loss of full-length Crim1 affects the regulation of VEGF-A delivery to the glomerular endothelial cells, resulting in increased activation of the VEGF-A signaling pathway in these cells. This dysregulation would be expected to mimic most closely the mouse model of podocyte-specific overexpression of VEGF-A (5) or the model in which two of the cell surface binding isoforms of VEGF-A (VEGF-A164 and VEGF-A189) have been knocked out (6). The first of these models shows a collapsing glomerular nephropathy, whereas the latter shows glomerular sclerosis. Neither of these phenotypes exactly portrays the phenotype presented by the Crim1KST264/KST264 mouse, although examples of collapsing glomerulopathy were seen in the adult homozygote. The extensive series of VEGF-A transgenics do show that regulation of VEGF-A is tightly controlled with only minor changes resulting in profound effects on glomerular development. Our study would support this by representing another subtle variation in VEGF-A availability and hence activity. That the glomerular phenotype persists in the adult, in particular the loss of endothelial fenestrae, suggests that regulation of VEGF-A continues to be important in the maintenance of the filtration barrier. The mesangial defects may be secondary to changes in endothelial cell architecture or GBM defects that result from the podocyte anomalies or may reflect a primary defect given the expression of Crim1 in the mesangial cells themselves. The glomerular defects that are present in the embryonic Crim1KST264/KST264 mice, in particular the dilated and simplified capillary network, resemble those that are found in other knockout models, such as the integrin α3 (32), PDGF-B (33), and PDGF-β receptor knockout mice (34). Although it is possible that one or all of these proteins directly interact with Crim1, their absence may simply affect the development of similar components of the glomerulus to elicit a similar phenotype. We have shown that Crim1 can bind PDGF-B, but PDGF-B is expressed in the endothelium and not coexpressed with Crim1. We previously showed Crim1 binding of BMP-7 (12). BMP-7 is expressed in the podocytes and is the only BMP expressed in the mature glomerular tuft (35). Expression levels of BMP-7 have been reported to decrease in rat and mouse models of ischemia/reperfusion and ureteral obstruction (36,37). Because Crim1 and BMP-7 are coexpressed in the podocyte, it is possible that BMP-7 signaling is also compromised in Crim1KST264/KST264 kidneys. Smad1/5/8 are the intracellular signaling molecules within the BMP pathway (32). Because the reduction in phospho-Smad1/5/8 levels observed occurs only in the podocytes of the mature Crim1KST264/KST264 17.5 dpc glomeruli, this most likely reflects late podocyte damage rather than being a direct result of Crim1 loss. Our demonstration of a glomerular defect that results from a disruption to the VEGF-A gradient across the developing vascular tuft adds to the growing literature regarding the need for tight control of VEGF-A in glomerular development. Crim1 seems to be a promiscuous regulator of growth factor delivery, because we have shown binding of Crim1 to a variety of cystine-knot–containing growth factors. Hence, the many defects reported in these mice, including renal and nonrenal anomalies, may reflect disruptions to gradients of more than one of these factors. This pleiotropic role for Crim1 in the modulation of delivery and effective activity of a number of growth factors has far-reaching implications for the biology of related proteins, including chordin. The biology of Crim1 will best be dissected using a Crim1 allelic series of tissue-specific knockout mice as has been applied to VEGF-A itself. This work was funded by the National Health and Medical Research Council of Australia (grant 301056), and the Transgenic Animal Service of Queensland is supported by the Australian Research Council Special Research Centre for Functional and Applied Genomics. T.G. was funded by INSERM (Institut National de la Santé et de la Recherche Médicale) France. M.H.L. is an National Health and Medical Research Council Principal Research Fellow. We thank Marc Tessier-Levigne and Jeff Searle for scientific advice and technical assistance and Margaret Cummings for advice on pathology. The laminin α5 antibody was a gift from Jeff Miner. We acknowledge the support of staff in the School of Biomedical Sciences Animal Facility, the Transgenic Animal Service of Queensland, and the Queensland Histology Service, Queensland Institute of Medical Research. We thank the Centre for Microscopy and Microanalysis of the University of Queensland. We remember our colleague Toshiya Yamada.